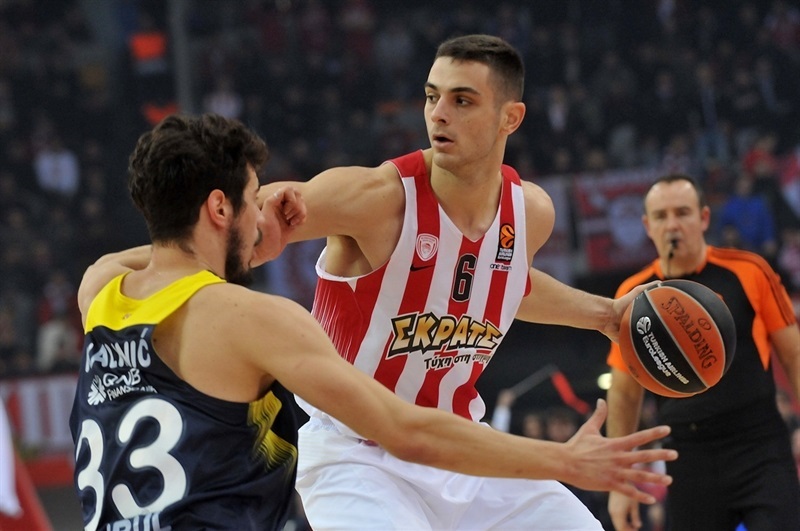 Olympiacos Piraeus welcomed back a couple of familiar faces and went on to hold off visiting Fenerbahce Istanbul 71-62 on Thursday night at Peace and Friendship Stadium. 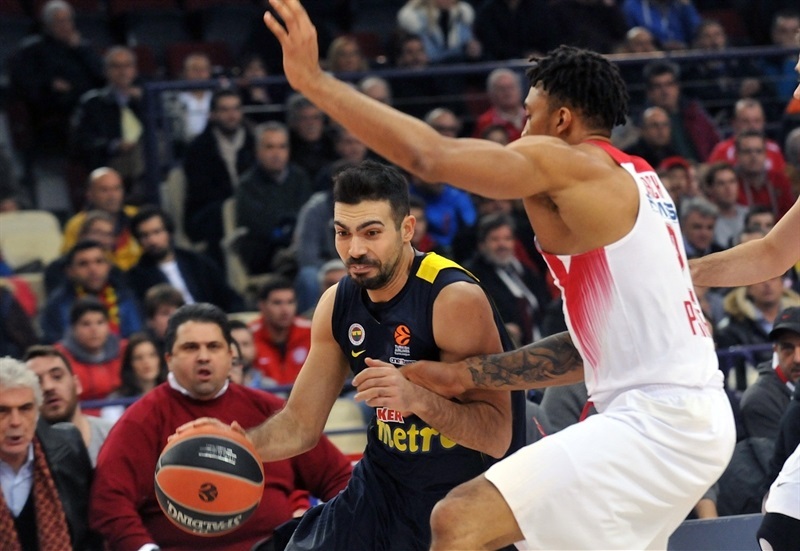 The win improved Olympiacos to 10-5 and a share of the second place at the halfway point of the regular season, while Fenerbahce dropped to 9-6. 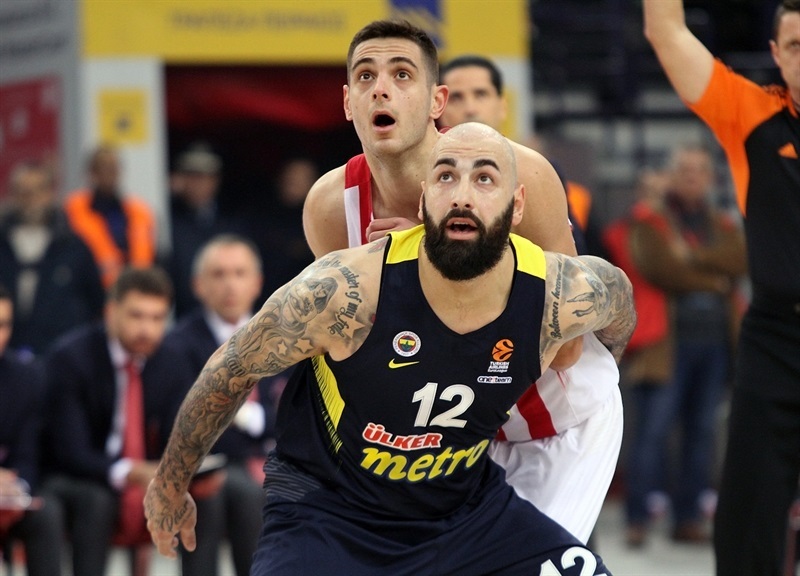 Former Olympiacos players who helped the team to back-to-back EuroLeague titles in 2012 and 2013, Kostas Sloukas and Pero Antic, were honored at center court before the game. 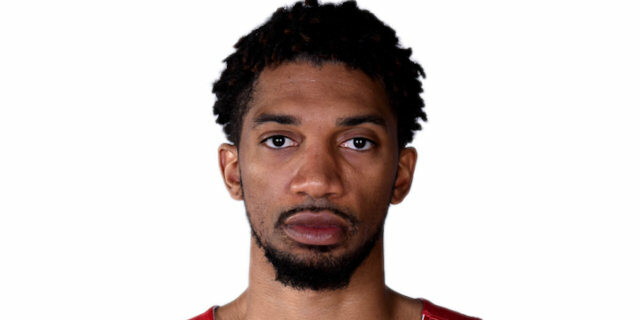 Olympiacos pulled away early behind Khem Birch, before a series of three-pointers had the hosts up 40-21 at halftime. 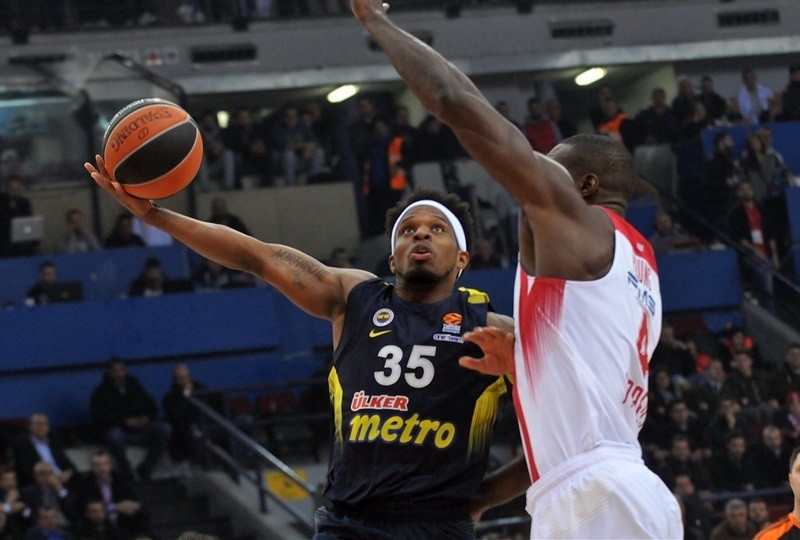 Olympiacos built a 23-point lead in the third quarter, but Fenerbahce rallied behind Luigi Datome and Bobby Dixon, however the Reds held on. Birch finished with 10 points and 13 rebounds, 7 of which were on offense. Matt Lojeski netted 14 points, Ioannis Papapetrou had 12 and Erick Green nailed 3 of 4 shots from downtown and finished with 11 points. Jan Vesely amassed double-double of 22 points and 10 rebounds for the visitors, but did not get much help until the final quarter when Datome and Dixon stepped up. Datome scored 10 points, Sloukas had 10 points and 6 assists, and Dixon finished with 9 points in defeat. 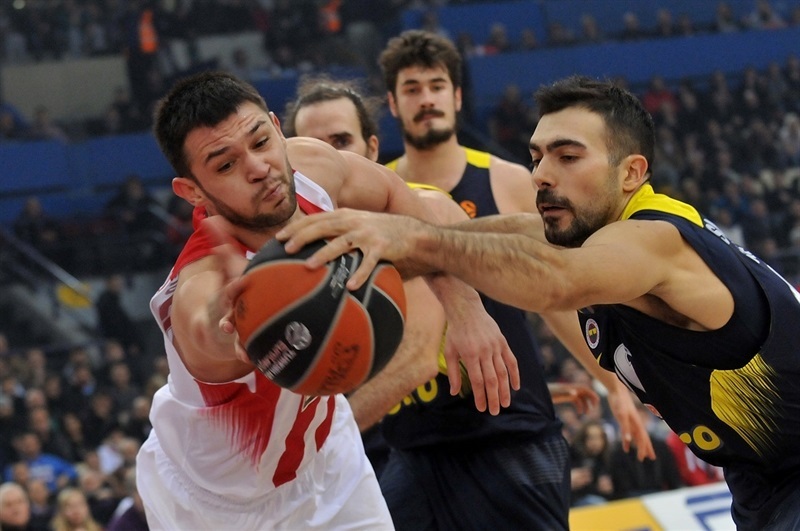 Olympiacos started strong defensively and did not allow Fenerbahce to score in the opening three minutes. 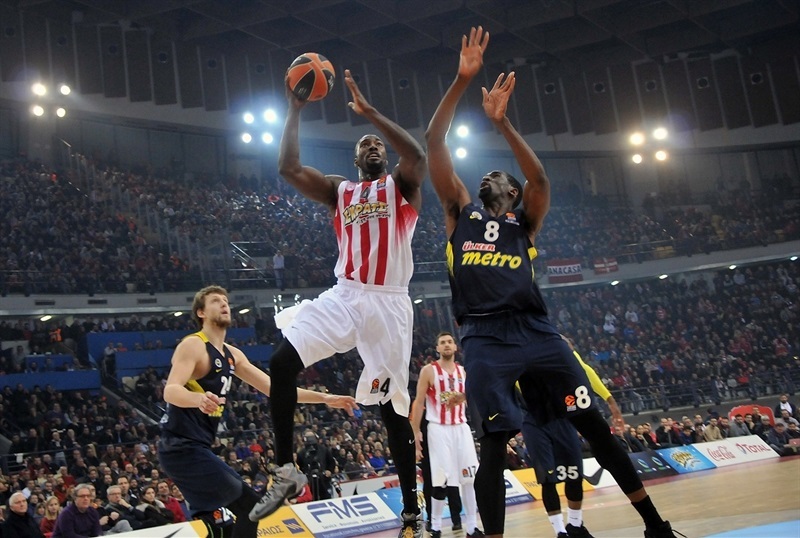 Sloukas from downtown and Antic inside gave Fenerbahce a 4-5 edge, but Birch was everywhere for Olympiacos. He grabbed 3 offensive rebounds and scored 8 points. With help from a Kostas Papanikolaou three-pointer, the hosts opened an 18-9 advantage after 10 minutes. Lojeski and Green hit three-pointers from each corner to extend the margin to 26-13 in the second stanza. Aside from one free throw each from Sloukas and Ekpe Udoh, it was Vesely as the only player who managed to score for Fenerbahce in the final 15 minutes of the first half. Vesely tallied 14 points in the first two quarters, but the hosts kept pulling away. Green hit 2 more threes, Papapetrou added one, and Vangelis Mantzaris banked in another one, extending the margin to 40-19 entering the final minute. 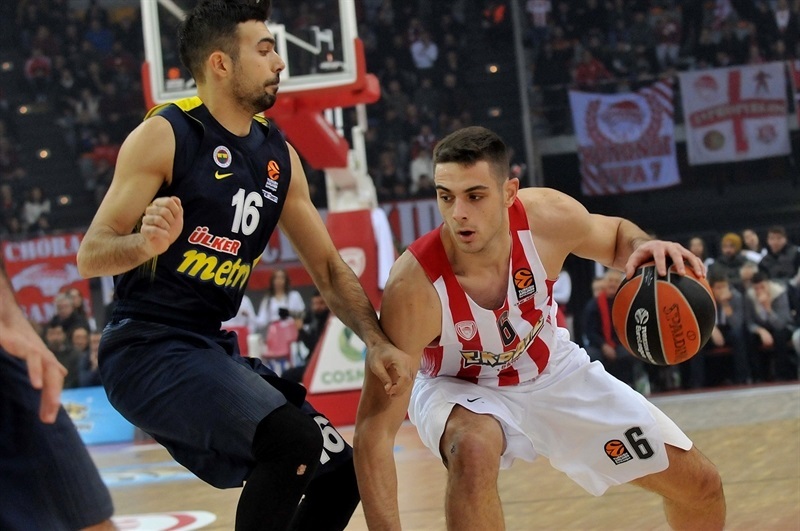 Olympiacos led 40-21 at halftime, and the hosts continued where they left off after the break. Papapetrou and Mantzaris made triples, and Birch fought on the offensive glass, opening a 48-25 margin. Fenerbahce got it started offensively with a triple from Datome. 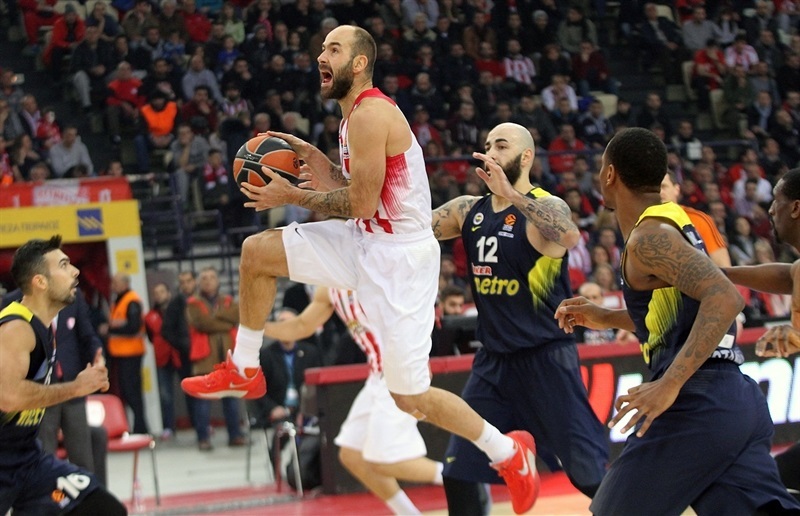 Udoh and Sloukas scored inside, and Antic hit from the outside, but Olympiacos did not allow the lead to slip away. The Reds were up 58-40 after three quarters and in complete control. Dixon cut the margin early in the fourth. Lojeski hit a corner three to make it 63-49, but Datome answered from downtown, and Dixon’s three closed the gap to to 65-61. 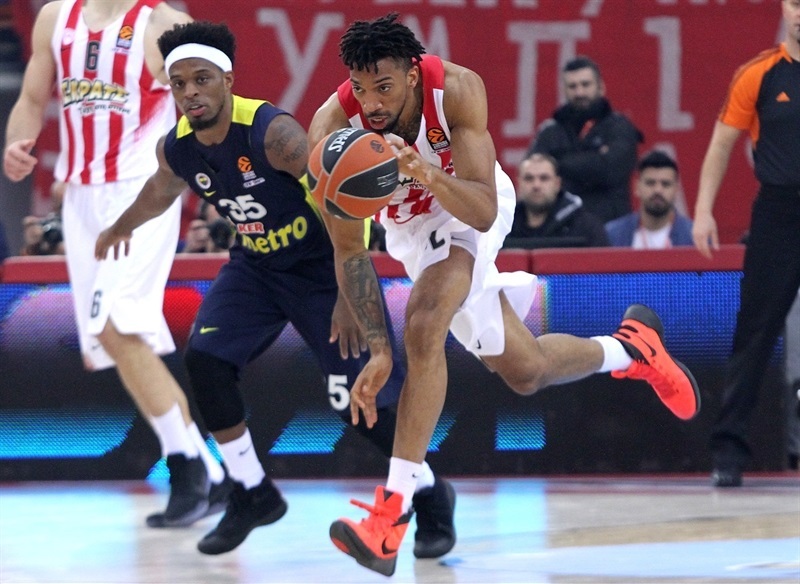 Dixon had a shot to cut it to 1 point, but missed an open three, before Spanoulis banked in a tough runner with 63 seconds left and Olympiacos held on. "Tonight there is no doubt we deserved to win the game. With the way we approached the game, with the determination we had, we forced one very good team with very good experienced players to score just 21 points in the first half. We put our terms for the game, and until the end of the third period we dominated the game in both ends of the court. Of course, Fenerbahce is a very good team, they tried to react. We saw they scored a lot of easy points at the moment when we were not moving the ball on offense, and we were not finding the best option to shoot. But at the end, we were very focused and with two, three good defenses, and two, three good offenses on the other side, we got a good enough lead and good enough difference for this type of the game. Congrats to all the players for the effort and desire they had for the game. We saw a lot of players who were diving for the ball, hustled a lot to get second-chance balls after offensive rebounds, and in general they won every small battle in the game. We need to continue in the same way. Stay humble and continue in the second part of the regular season, which will be more difficult. Thanks to the fans who gave us a lot of support in the game. The gym was full for the first time this season, and we want that from now on. There is a big effort from all of us, and we need their support every single day. 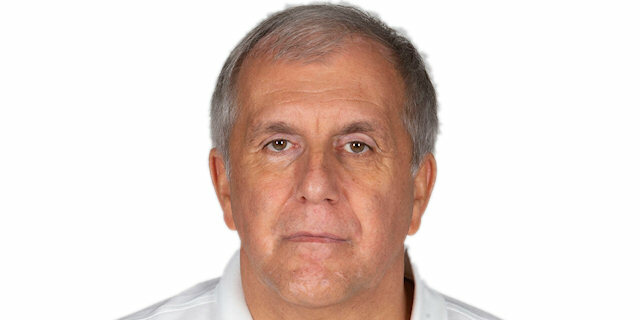 Congrats to my colleagues, my staff, who prepared the game very good." 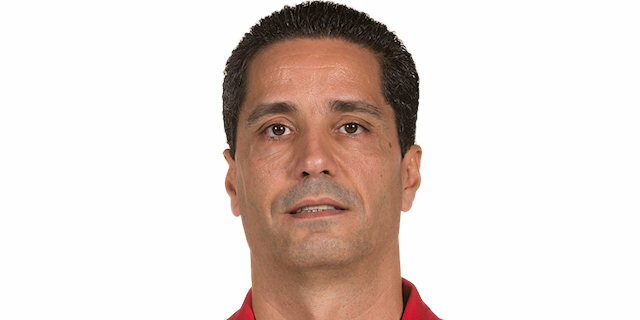 "Congratulations to Olympiacos, because they deserved to win the game. They opened the game in an excellent way, very aggressive offensively and defensively, but first of all defensively. They had more energy, they were faster than us, with more desire, and that was the result of the first half. Looking at the stats at halftime, it was amazing that except for Jan Vesely, all the rest of our players shot 2 of 23 for two and three-pointers combined. So, it was almost normal to have a result that we had at halftime. In the second half we tried to wake up, come back in the game, and the positive thing is in the last quarter, we came into a situation that [down by 4] Bobby Dixon had an open three-point shot. But it is another question why from being down 4 points in the last 90 seconds we end up losing by 9. From the games you always take positive and negative things. We had a lot of negative, and a little bit of positive. Obviously, if we play like we did today, responsibility is always on the coach. We must really think about everything about our team. Because it is not enough to react and play five, six minutes of the game. The good thing is a lot of games are in front of us and let’s see how it will be in the future." "We kind of slacked off a little bit near the end. But we have a great team, and we were not worried or anything. We just played our game. I agree it was a win of determination, especially for me. They beat me five times last year in the Turkish League. I had to come out strong and get this victory."